Two coasters were seen lying at the riverside berth at Shieldhall on Friday evening. Further away of the two is Alstership's JOHN-PAUL K. which had completed loading a cargo of scrap metal for export to Spain. 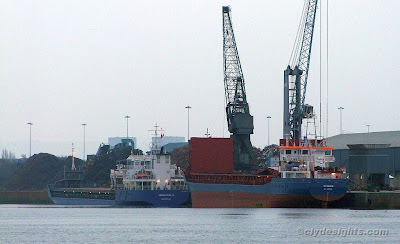 The other vessel, OSTENAU, which I believe may be the first Strahlmann ship to visit the Clyde for some time, had been discharging a grain cargo before she too commenced loading scrap metal. She is one of the popular 'Rhein' class ships of 3,680 tonnes deadweight built in Slovakia, this particular vessel having been completed in August 2005. JOHN-PAUL K. sailed a couple of hours later for Seville.